What Are the Different Types of Nail Files? Emery boards are one of the most common types of nail files. A steel nail file may be more suitable than an emery board for filing toenails. There are different types of files that can be used to shape, shorten, and smooth a person’s nails. Emery boards are typically the least expensive option, and are generally made from cardboard and ground corundum, although they rarely last for long. Metal files, made with ground metals, and are popular for use on thicker nails or for when excessive filing is needed. Glass files generally provide the same durability as metal ones with a finer texture, which is created with a mixture of crystals. A nail file may also come in a foam block form, and contain other sides meant for buffing the nails. Emery boards are one of the most common types of nail files, and can be found in nearly any convenience store. These are typically made from cardboard, although other bases can be used, and the abrasive surface is comprised of finely ground corundum, a mineral. In many cases, an emery board is dual-sided, with one side being rougher than the other. When new, these types of nail files provide the same amount of fine filing as the higher-end varieties. Despite this, emery boards tend to wear out rather quickly, especially when compared to other types. As they are constructed of cardboard, the file can bend easily, causing dents in the product that can make it difficult to achieve a smooth nail edge. For shaping thicker nails, metal nail files are often ideal. These are generally the coarsest variety of this beauty tool, and consist of a piece of metal with ground metals and minerals on one or both sides that provide the abrasiveness needed for filing. Metal nail files tend to last a long time, yet they are not typically recommended for detailed shaping or for use on thinner nails, as the abrasiveness of the product can cause tearing and peeling in the nails. 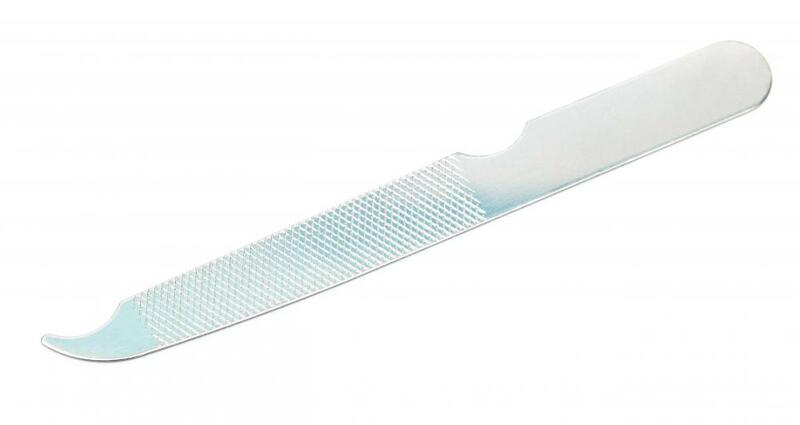 Glass nail files provide users with the durability of a metal file and the ability for detailed shaping found in an emery board all in one product. Contrary to the name, this tool is typically made from ground crystals baked onto a piece of durable glass. The crystals provide a very fine abrasive surface for filing. While glass nail files dull at approximately the rate of a metal file, they are not as durable as metal if dropped or handled roughly. A nail file may also be found in a dual product, often referred to as a nail block. This product is typically made from a foam block that has finely ground emery on one side, and then several other sides with varying levels of abrasiveness, from rough to smooth, intended to buff the tops of the nails. Some may use a more durable base than foam, although the concept is the same. These types of nail files typically last as long as emery boards. How Do I Choose the Best Nail File? What Is a Power Nail File? How Do I Use a Glass Nail File? What Is a Nail File Drill? How do I Choose the Best Crystal Nail File? What is a Diamond Nail File? What Kind of Nail File is Best to Use? @ocelot60- It sounds like a nail block may be the tool that you need. Since it has different finishes on each side, there is sure to be one that will work perfectly for your type of nails. It's also an economical tool, because it is like several tools all in one. @ocelot60- I think that you should try an Emery board that has a coarse finish. While not being as harsh as a metal nail file, a coarse Emery board is good for nails that are on the thin side yet need a lot of filing. Another option that may work for you is a crystal nail file. This type of file has a finish that is actually similar to some types of Emery boards. A crystal nail file is also good for all types of nails, including thin nails. It is also a good tool for doing a lot of filing on nails, because it gently shortens and shapes them. I think that a crystal nail file has a finish that lasts longer than that of most Emery boards. My nails aren't very thick, but I like to let them grow long then file them down. However, I prefer an Emery board to a nail file. What is the best type to use for fairly thin, but long nails?